WHERE IS 127? Why can't I download the new comic. This is stupid!!! They took out in app purchasing, which was one of the reasons I loved this app. I will be getting my issues elsewhere, now. Sometimes this app allowed me to read comics, other times not. This app has a mind of its own I guess? Or is my iPad broken. Good, although I've been having some trouble downloading issues. 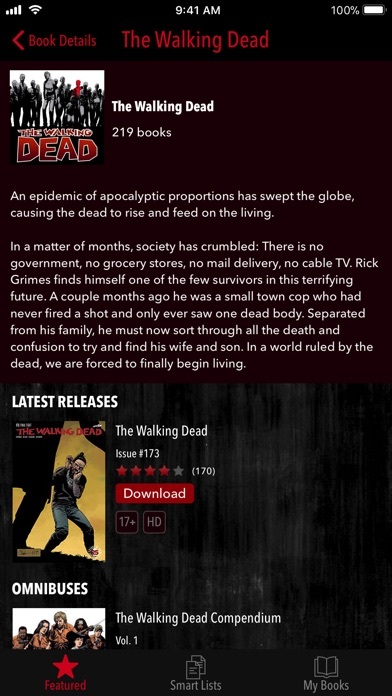 This is a great app if your a comic fan or just someone getting into the walking dead. 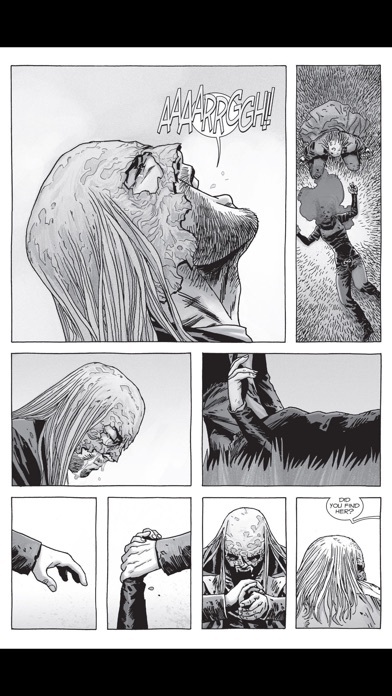 I love the comics, but I really wish you guys would bring back TWD Assault! It was a great game and even if you guys don't see this I hope it comes back. What has it been, less than a month since Jeff Bezos bought the most promising tool for renewing the mass distribution of comics in the digital era? I'll give the man this: he's moved faster to undermine an existing technology for the benefit of his own company than General Motors did when it sabotaged Los Angeles's public transit Red Line for the benefit of the bus fleet they wanted to sell the City of Angels. Job well done, Jeff. Amazon did this. It did it for one reason, and one reason only: to advance their proprietary hardware platform, the Kindle, at the expense of Apple's platform, the iPad and iPhone. They have deliberately degraded the iPad and iPhone Comixology app so that users of the Kindle will have a better reading and purchasing experience. That's all this is about. They've destroyed the future of digital comics to give an advantage to their hardware platform -- and, in passing, to leverage their control of digital comics distribution to do to comic book stores what they've already done to brick-and-mortar book stores. F*** you, Amazon. I have switched to iBooks. Probably going to cancel my Prime membership also. What a ridiculous sneer to your customers this is. A NEW RELEASE IS NOT ON THE APP!!!! YOU IDIOTS ARE USELESS!!! NEVER USING APP AGAIN!!! I CAN GET IT FREE ON YOUTUBE!!! WHERE IS THE WALKING DEAD SEASON 2?! I realized the walking dead season 3 would come out so I would re download season 2 but it's not in the AppStore I thought this was it but no! Please put back the walking dead series back!! Thanks for fixing the issue with the buy button. Great app. Better than a physical book. So easy to take the collection on the go. 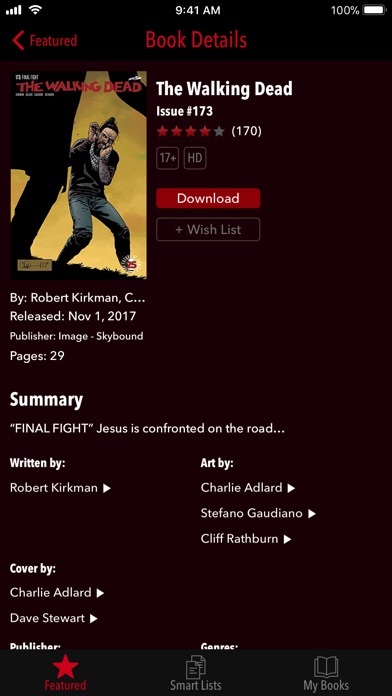 Kirkman keep up the great story. If you want to get the walking dead comics, buy then off the internet!!! I bought a paper copy of the comics for 35$ that had 48 issues. If you buy the first 48 issues on the app it will cost 100$. Numbers don't lie!!!! Charge you 2.99 a comic inside the app. First issue was to be free, but only offers to "buy" issues. Doesn't work, so, needs to be removed from App Store like so many other apps offered. If they don't work, needs to be deleted, as is what I'm going to do as soon as this is posted, and I'm a HUGE TWD fan. Great app for True Walking Dead fans! 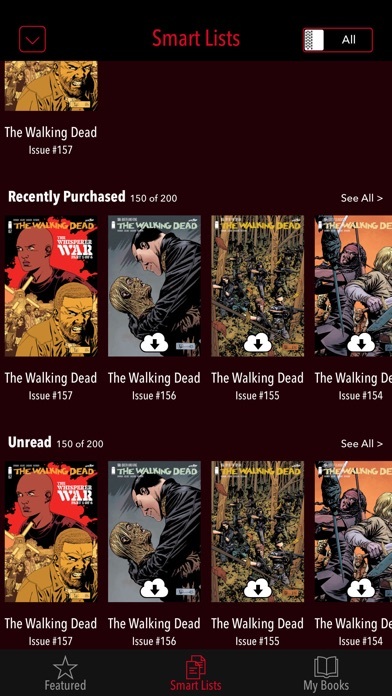 Such a easy and great way to purchase and read The Walking Dead comics. If your somebody who's already read them or a fan of the show that wants to read them this is the perfect place to get all of them, in single issues or in bundles. It's definitely worth a download you can get the 1st issue for Free! This doesn't even let me into the app. Waste of time and space, this is not worth it. This app is not working properly when you buy a comic it fails the download. I have tried this on 3 devises and all of them failed. The app is broken do not buy until they update the app with a fix. Love the app!!! It's like the only app I'm ever on now. Now this is not a review of how good of comic this is. I love the walking dead this buyer is not that worth it. It's cheaper on buying it in a comic store. You will fall in love with the series even if you don't watch the T.V. show. Following up to another reviews question Darrel is a made up character from the T.V. show not from the comic. Last two times i tried to buy the comic over the last month, the app crashes right on purchase. Terrible experience. Update: new episode isn't popping up. Where is 127? I use to love this app until they changed it to where u can no longer purchase the comics in app. You have to go round about by going to the comixology website. Buy it their, add it to your cloud then download the books to the app. Plus re-enter all of your paypal or credit card info again. When before it was just two clicks and you were reading the comic. Never a smart business move to make it HARDER for the customer to get what they want!!! I'm informing my bank that this was a fraudulent purchase or scam. Fraud is a felony offense. Last month I tried buying the game. It says bought but never downloads. Then charges me a week later. It's doing the same thing this month. Won't let me download. Complete garbage. I have been unable to download the comic since April of this year, and yet they continue to charge me $2.99. I've contacted Apple support and they directed me to the developer website. I've tried multiple times to complete the Contact Us form on the developer website, only to have it fail every time. I waited months for it to get fixed, figuring there would eventually be an update, yet that has never come. I've uninstalled and reinstalled the app multiple times today and am now in an infinite error loop. Right after I submit this I will be canceling my subscription. I'd love to get my money back, but I doubt that will happen. Without a comic store in town, I'm glad to have this as an option. While it can't replace reading from a compendium, it's great to have the issues as they come out at the touch of a button. I bought books then deleted the app and I can't get the books back. The purchases won't load and you can't read them. It's unprofessional to treat your customers this way. $15 bucks gone !!! How hard is it guys? Just put your stuff on kindle and be done with it. At least Amazon knows what it's doing. It's crap! No in ap payments! Come on bezos, you could have let us know! I hate myself for still buying the comic from the web page. But I won't buy any other series any more. Everytime I make a purchase on the app it doesn't let me download the comic I purchased. It keeps saying that either the comic is corrupt or there was an error requesting it. I want my money back because I go to buy a comic and I don't even get to read it. They sell each one for 14.99$ which is the regular price per volume for a physical copy. Go with comiXology connect your Amazon account to your comiXology account buy the digital volumes on Amazon for 7.99-9.99$. Same exact thing. I think it is just bad. The comics are good except that I can't create a new account so can you fix that. Thanks!! I try to download, but it keeps saying error. Please fix this problem! Great app. Unique viewing experience. Way to expensive, 1.99 for not that many pages. And a lot of page with little to no dialogue.